The Dragons won the toss but differed to the second half and Ridgeland had the ball first starting at the Ridgeland 28-yd line. The Panthers used 7:57 of the clock, and two timeouts, before punching it in from five yards out, giving Ridgeland a 7-0 lead with 4:43 left in the opening quarter. The Dragons first possession of the game would start on the Pickens 26 yard line. Facing a fourth down, the Dragons rolled the dice and went for it and Shannon Brooks scampered for a 52 yard gain, and Marcus Byrd finished it off with a 10 yard touch down run with 2:50 left in the 1st quarter deadlocking the game at seven heading to the second quarter. Ridgeland had it again at the Panthers’ 28 but the Dragon defense held and Pickens took possession at the Dragon 40. A turnover however gave the Panthers the ball back at the Ridgeland 49. The Panthers regained the lead, 14-7, with 7:35 left in the first half. Back to back three and outs by both teams stalled the scoring until an 86-yd bomb from Byrd to Zack Herman tied things up at 14 with 2:39 left in the half. The first half ended the same way we began it, tied. Ridgeland started the sedond half with a surprise pooch kick and recover the ball at the Dragon 31, eventually scoring on a six yard run, taking the lead again, 20-14, after a missed PAT with 9:01 left in the third. That was all the scoring in the quarter as neither team could get anything going offensively after the first Panther score. The Panthers added another score with 6:48 left in game to stretch the lead to 28-14, the Dragons biggest deficit of the season; however, Shannon Brooks’ two yard touchdown run, cut the Panther lead in half, 28-21, with 4:23 left in the game. A long run from Ridgeland set up an eight yard touchdown run with 3:24 left making the score 35-21 in Ridgeland’s favor. Shannon Brooks ran it in for a second time cutting the lead to seven, 35-28, with 1:13 left but that’s how this one ended. Dragons are now 3-1 on the season and 0-1 in region play. For the game Pickens totaled 11 first downs, was 2-6 on third downs and 1-1 on fourth downs. Pickens gained 416 total yards on 37 plays for an average of 11 yards per play. The Dragons ran the ball 29 times for 257 yards averaging 8.8 yards per carry and threw it for 159 yards averaging 19.8 yards per pass. Marcus Byrd finished 5-8 passing for 159 yards and a touchdown, and 68 yards rushing on 9 carries with a touchdown. Shannon Brooks would end the night with 189 yards rushing on 19 carries and 2 touchdowns. Zack Herman had 129 yards receiving on 3 catches for a 43-yd average and a touchdown. Defensively, Zack Herman led the team with 21 total tackles, 15 solo. Kyle West had 14 total tackles, nine solo, and Ty Prather chipped in 13 total tackles, eight solo, and a sack. Marcus Byrd punted 3 times for 119 yards, a 39.7 average. Ty Chastain continued his excellent extra point kicking going 4-4. 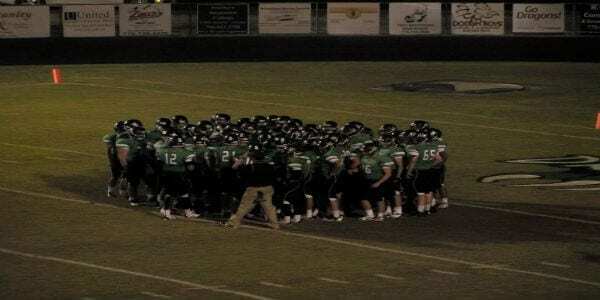 The Dragons look to get back on the winning track Friday night on October 3rd as Pickens hosts the Northwest Whitfield Bruins at Dragon Stadium. On the season the Dragons are averaging 39.3 ppg on offense and giving up 21.3 while the Bruins average 28.5 ppg and give up 18.3. Both teams are 3-1 on the season, Dragons are 0-1 and the Bruins are 1-0 in region play. This will be the third meeting between the two teams with Northwest Whitfield winning both in in 2012 and 2013.